Nachosaurus Nacho Dip and Snack Dish Set has been added to your shopping cart! Got a picky eater? Drastic times call for Jurassic measures! Our pterribly fun Nachosaurus Nacho Dip and Snack Dish Set is a gift from the dino gods! 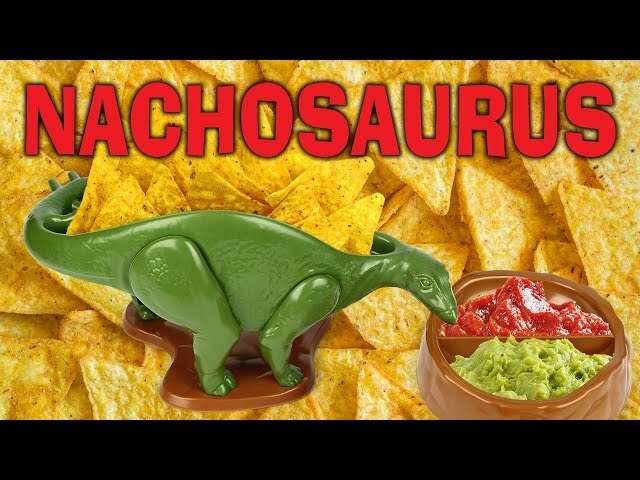 Our pterribly fun Nachosaurus Nacho Dip and Snack Dish Set is about fossilize it's way into your heart, and at solidify its place at your dinner table! Especially if you have a picky eater on your hands! After all, drastic times call for Jurassic measures! Thought to be extinct the prehistoric Nachosaurus is back... and ready to carry and serve your favorite snacks! Modeled after a Stegosaurus dinosaur, this meal-time accessory will turn your next Taco Tuesday Jurassic, devouring chips and dip with style! Just stack your nachos and bring your very own stegosaurus (and your appetite) back to life! Includes a bowl for the primordial dip of your choice.! But not just for nachos! This unique set can hold fries, nuts, popcorn, chips, pretzels, and much more! Sparking your imagination at meal time by combining your love of food and dinosaurs with the ultimate accessory! GREAT GIFT: Perfect for kids and kidults that are looking to add a bit of fun to the dinner table! HIGH QUALITY DESIGN: This 100% food-safe, BPA Free, durable ABS plastic taco holder can handle just about anything young children do to them. Includes on dinosaur shaped dip bowl and snack dish set. Makes Meal Time Fun for All Ages! Top-Rack Dishwasher Safe. Made out of Plastic. Completely Food Safe. BPA Free, Lead Free, and Phthalate Free. Not Microwaveable. Try it with Nachos, Popcorn, Fries, Chips, Pretzels and much more! Measures approximately 9 inches long x 4.2 inches wide x 4.5 inches tall. Designed by Barbuzzo our Nachosaurus Nacho Dip and Snack Dish Set is a Jurassic sized fun!